Which blockchain-platform gives apps, games & businesses the power to attract hundreds of paying users within days after launch? Drug Wars, a new blockchain based strategy game, launched their pre-release version officially yesterday. 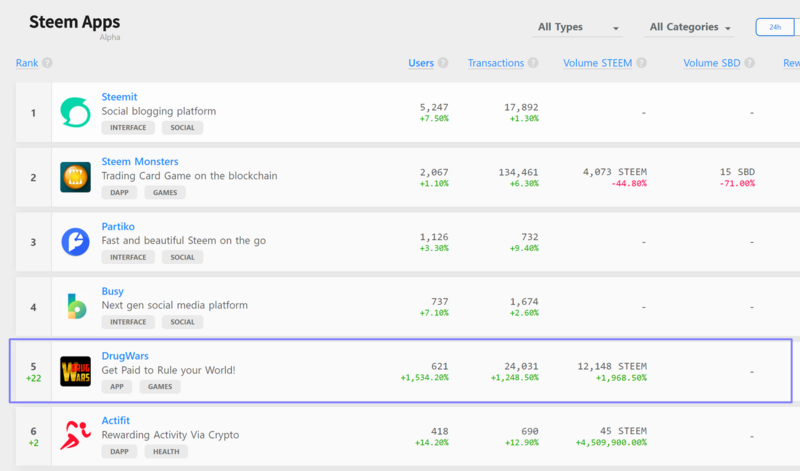 Because Steem at its core is a community-first platform, the launch was shared automatically by a diverse number of Steem users via Steemit.com, Partiko & other interfaces. Through this, the game instantly became a hit. And the numbers you'll see below are worth more than a thousand words. Keep in mind, that Drug Wars is a game which has been in development for less than a month by an indie-developer team. Imagine what a professional company from the gaming-industry is able to do. If you've got friends who are game developers, entrepreneurs or interested in building a crypto/blockchain business - share this post with them! The best time to build decentralised blockchain games & apps is now!